Writing for Mint last year, Prashant Jain, executive director and chief investment officer of HDFC Mutual Fund, said it was not easy to remain invested in equities for long periods. “Those who can simply sit still know its immense benefits," wrote Jain. NTPC Ltd seems to be practising this precept, albeit in a slightly different way. India’s largest electricity generator has remained silent on the opportunities in stressed power plants, despite having sound financials and a balance sheet to stomach acquisitions. The company may well be waiting for the stressed assets to enter the National Company Law Tribunal (NCLT) for the proceedings to acquire legal sanctity, which can help it avoid undue scrutiny. The caution is appreciated. The NTPC stock has gained 6.8% in the past month compared to 1.9% rise of the Sensex. “(NTPC) has been most prudent in its acquisition and turnaround of inefficient state plants that came with assured return on equity (RoE), power purchasing agreement (PPA) and coal," JM Financial Institutional Securities Ltd said in a note, adding: “Alternatively, NTPC has already proposed a partnership with banks, wherein banks may take over the ownership of the asset, while NTPC is roped in as the technical partner to operate these plants for a fixed fee. This will benefit NTPC as it could earn higher revenues without incurring commensurate costs and infusing any equity capital." Even if the company has to bid for and acquire a stressed plant, NTPC has to be careful that it does not dilute its returns. Despite inexpensive valuations and a strong capacity addition pipeline assuring long-term earnings growth trajectory, the stock has not done too well in the long run. Its returns have been 13.9% per annum over the last three years, slightly lower than the 14.9% of the Sensex. One reason is the cost under-recoveries the company has witnessed of late. The other is the uncertainty over impending tariff regulations. 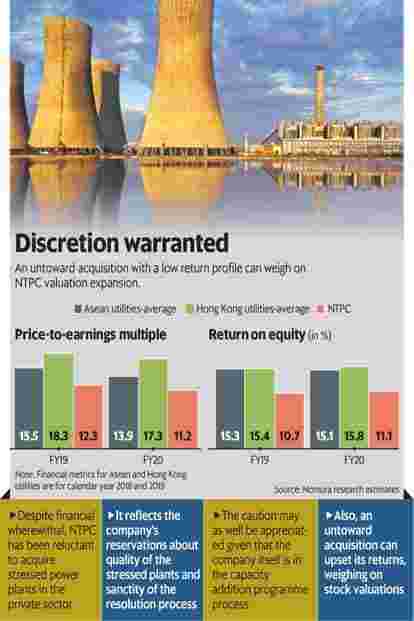 Even so, many believe the current low valuations—NTPC trades at 11 times its FY20 price to earnings (P/E) estimates—reflect the market’s concerns. But low valuations alone cannot guarantee returns. As Nomura Research pointed out in a recent report, relative to its regional peers in Asia (Asean and Hong Kong), NTPC’s P/B (price-to-book value) and P/E multiples are fairly benign, but not compelling if one views them in conjunction with expected return on equity (see chart). NTPC hopes that it will not see adverse regulatory changes, which will help improve its return ratio. A returns dilutive acquisition now will, however, upset the assumption. “Deployment of cash to acquire assets in non-core business lines with low visibility on returns and/or leveraged buyout of generation assets entailing returns, which are inferior to those in its in core business, would delay the improvement in reported RoE," warns Nomura Research.